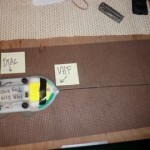 As I mentioned in my first blog, I am here to help out with the radio-tracking of D-tagged animals. Since the D-tags store all the valuable data they collect, they must be recovered (and downloaded) after they detach from the whales. To accomplish this, every D-tag we deploy also has a small VHF (Very High Frequency) radio transmitter on board. This radio emits a short ultrasonic pulse every second which we can pick up using specialized radio receivers. By listening for these radio signals with directional antennas, we can perceive where the whale is relative to our location. This means we can stay relatively close to the tagged animal and collect the reams of synoptic data (krill abundance, oceanographic variables, bathymetry) that are so important in the interpretation of the information the tag collects. 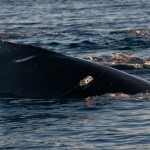 It also allows us to pinpoint the location of the tag after it comes off the whale to facilitate its recovery. “ ‘cause unless we get the D-tags back, we’re just Whistling Dixie!”. Truth is, tracking is much more of an art than a science. Sure you have to have some familiarity with the equipment so you can effectively trouble shoot when things go haywire but experience helps…a lot! I have been working with telemetry and data loggers systems for a number of years (full disclosure#1…I was originally trained to radio-track by Andy Read, let’s just say, “Way back in the day!”) and have been able to learn the (black) art through lots of blood, sweat and tears!! 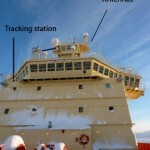 Up, way up, on bridge deck of the Nathaniel B. Palmer we have set up our little tracking station. This is a home away from home away from home.Everything you need is within easy reach (i.e. coffee!). We have an array of directional antennas that feed into a direction finder/receiver system. This allows one to monitor the relative position of the animal and keep track of its movements. 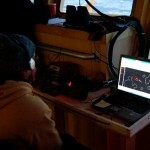 We usually track whales from a distance of 1-1.5km but on occasion move in closer to get a visual sighting. We also (thanks to Dave J!) have a plotting program that aids us in calculating the relative position of the whale. Radio-tracking is all about listening. Beeps are short, millisecond long pulses buried in background static (see above!). Our tags beep once every second. VHF transmitters transmit continuously but signals are only received when the whale is at the surface (water is too dense to carry the radio waves but they do fine in air!). We typically get (from humpback whales) 5 -10 short beep trains every 6-8 minutes. These correspond with surface breathing events following the longer feeding dives. Our relatively low-power VHFs have an effective range of about 5 km. The trick is to determine the position of the whale during the surfacing events, estimate the distance to the whale and adjust the course/position of the ship to stay in range. Sounds easy eh? It really is quite simple but things can get a bit more hairy when the whale decides to swim quickly away underwater, surfaces low so the tag never breaks the water’s surface, moves behind an island blocking the VHF signal, massive interference from the ship blocks reception or weather conditions impede signal quality. Naturally these things NEVER happen in the Antarctic….no really, never! So far things have gone swimmingly well on the tracking front (full disclosure #2…there was a two hour period in deployment 2 where no signals were received from the tagged whale who decided to put a small mountain between her and I, a bit of sweat but thankfully no blood or tears). We have successfully recovered all our D-tags, most within minutes of detachment. This is good because if the tracking team can put the tag boat on the whale/ tag for a speedy recovery, we can get right back to deploying new tags in our somewhat limited daylight. I’m not going to bore you all to death with any further content:encodeds of the wonderful and exciting world of radio tracking but feel that it is necessary to “clarify” a blog that was posted last year (see cross post- White Noise by Dave Johnston — posted May 04, 2009) in which the 6 stages of radio-tracking were carefully describ- ed. You may notice a few subtle “corrections” in my list for 2010! Stage 1. Anticipation. Dave was spot on with this. This emotion plays an important role in radio-tracking. We happily anticipate the start of the radio-tracking shift (visual tracking, as you surely already guessed, ends when the sun sets) because sunset means it business time baby! More importantly, we must also anticipate when the coffee will run out and make more before this happens. Stage 2. Anxiety about being the ‘one’. Again I couldn’t agree more. I often find myself worrying while tracking. Did I make the coffee strong enough? Will the other members of bridge crew like it? Do these Carhartts really make me look fat? Stage 3. Panic. Panic does sometimes set in when the coffeepot is getting low! Oh my god will it run out? Wait, remind yourself of #1 and follow through. Panic averted! Also realizing you didn’t eat enough dinner to get you through an all night shift and realizing your snacks are running low can cause a tracking panic attack! Stage 4. Blame and liability. Who made this coffee ‘cause it tastes like s*#@. Don’t they teach this stuff in schools anymore? Clearly not!! What’s wrong with our country? Stage 5. Depression. I always get depressed around 9AM because the sun is up and that means business hours are over baby! Stage 6. Elation! Ari gets a tag on about 3 hours later and that means we’ll be open for business again, fending off chaos during the long, cold, dark hours of night! P.S. Big shout out to Ben who is turning the big two zero! Reny says she misses you and claims beers will be on her following her return! Flandres Bay (Thurs., 5/27/10) – Gone with the wind: Frankly weather, we don’t give a damn!